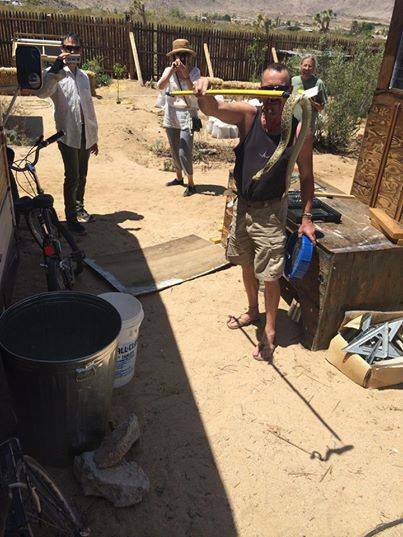 It's snake season and one Wonder Valley local recently asked me who to call to get the rattlesnakes out of her pool. Now, I've heard of this guy, Bert Lies, and people tell me he's the rattlesnake whisperer, but I want to state that everything about rattlesnakes is at your own risk. I am not making any claims, I'm just passing on information. I haven't seen a rattlesnake yet; a gopher snake, a red racer and a shovel nose, yes, but not a rattlesnake. When I do I'll be calling Bert. He does not harm the snakes. He removes them and relocates them. Bert Lies, 818-825-1226. This is also posted under the [ Businesses ] tab above.